It's a simple fact of life that Father's Day is not a holiday that stands on it's own. Just look at most retail promotions geared at "dads and grads". Families all over flock together for graduation parties and almost as an after thought they say..."and it's a Father's Day party as well...two parties in one!" And this isn't so bad, because by nature Dad's couldn't care less. Dad's like family get-togethers, good food, and a guilt free lazy afternoon. They're not worried about the celebration of man as patriarch. So in the duo holiday tradition Aaron's family celebrated baby Adam's 1st birthday on Father's Day. Barb, (Aaron's mom) as usual, went all out...she even had a bouquet of balloons and a sign on the street that said PARTY: This Way!------> which was meant to be humorous because it was really only a party for under a dozen people who all know exactly where Barb and Skip live. 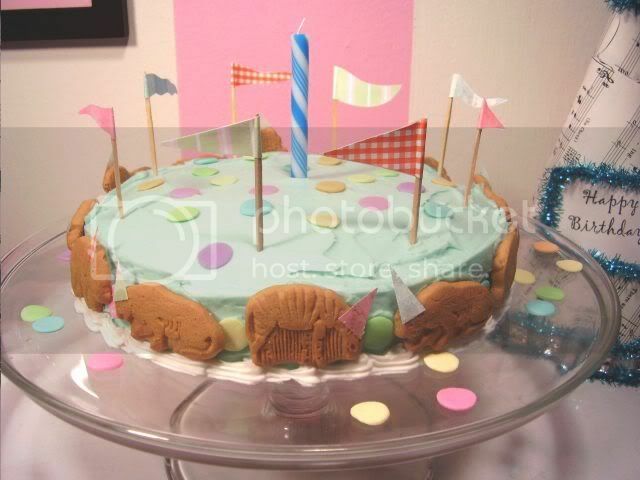 I made Adam's personal cake...the cake he'd be able to baby handle all he wanted. My plan was to bake it in the tiny round Wilton pan but on Saturday night the time slipped away from me and the store closed before I could get the pan. So instead I went with a one layer eight inch round and kept it simple, classic and sweet. Adam is not a cake lover. He touched it with one finger and sort of winced at the taste. I know Barb wanted the classic kid-with-cake-on-his-face photos but Adam just ain't down with the sweets...(yet!!) No problem, there were plenty of us to eat it. 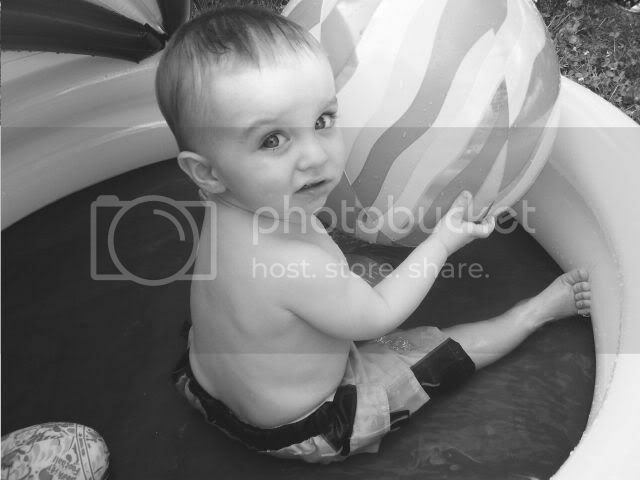 Afterward Adam took a dip in his new pool and it was one of the best things I've seen in a long time. There he was, the center of the universe, the little sunshine in his little pool for one and all of us grown-up planets revolving around him, amazed by his every little gesture and facial expression. One thing that kid will never lack is attention! We could've watched him all day...but like I said, it was Father's Day too. So I went to go visit my Dad while Aaron drove Mom Mom back home to south Jersey. 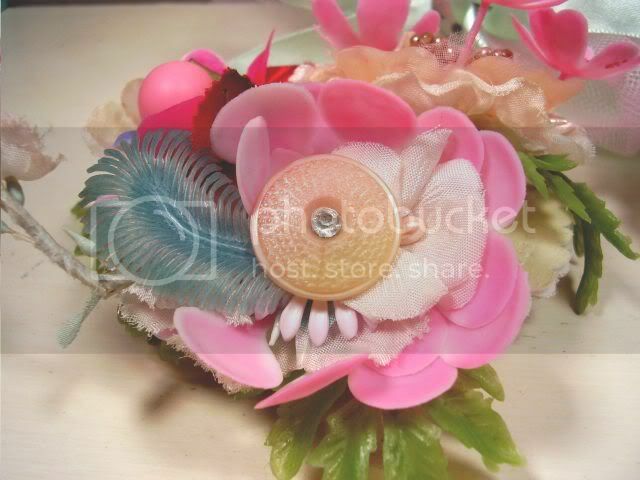 Check out these corsages!! Handmade with style and taste by Beth Holcombe. They are fantastic! 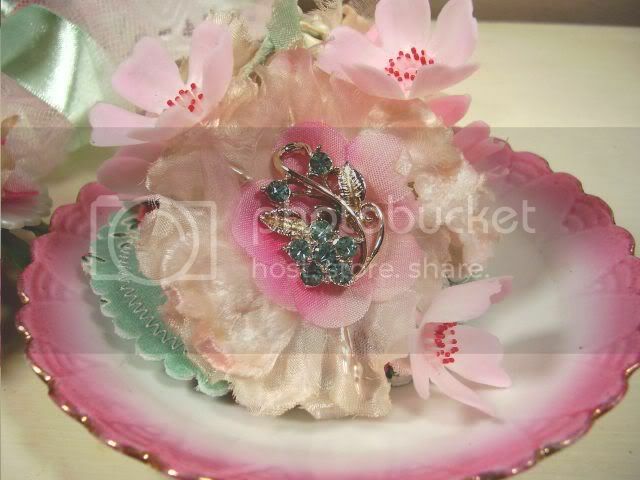 Vintage plastic flowers, buttons, beads, and sparkly rhinestone bits! I'm totally gonna wear 'em like crazy this summer on tank tops and cardigans and what rules is that they are super fab table top decor when not worn. And Beth's esthetic prowess is well rounded...evident in the presentation of these. 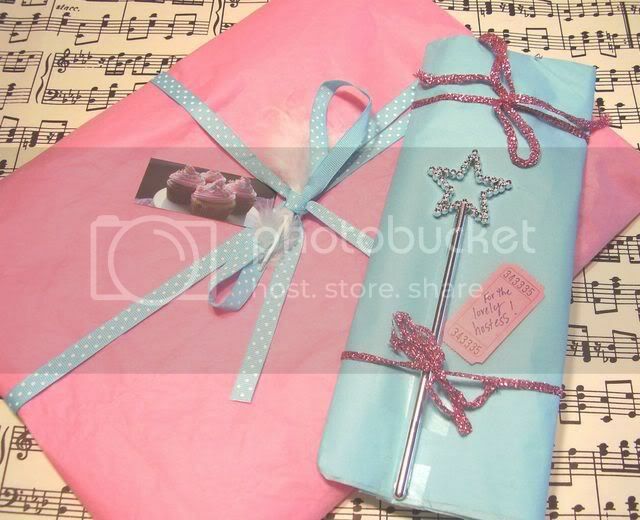 One she put in a basket tied with a pretty little bow and a fuzzy aqua toned chick. 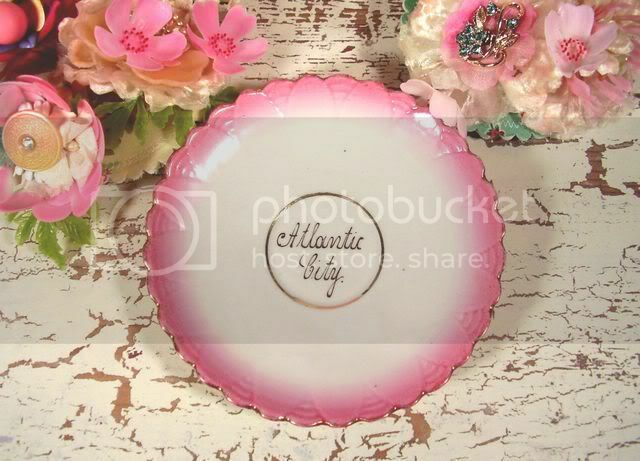 And the other came on it's own little vintage Atlantic city plate. She know's me too well!! 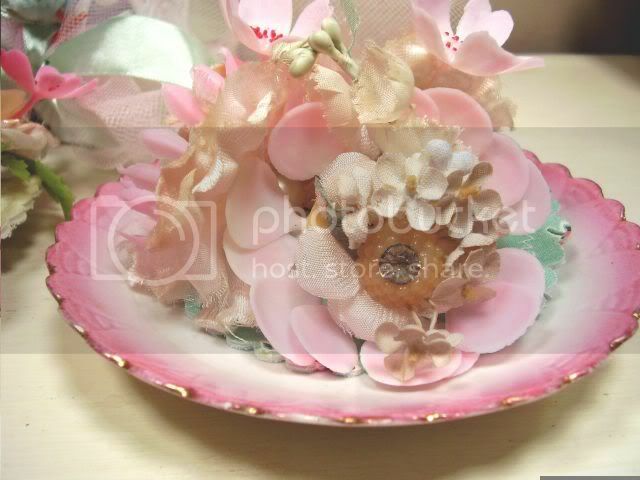 It's so hard to separate the corsage and the plate but I gotta do it because my bathroom wall is begging for a new addition to it's collection of vintage Jersey shore souvenir plates. Ohhh and just so you know...her BFF is none other than Suzy Spence aka Georgia Peachez!! Now is that a dynamic Duo or what? 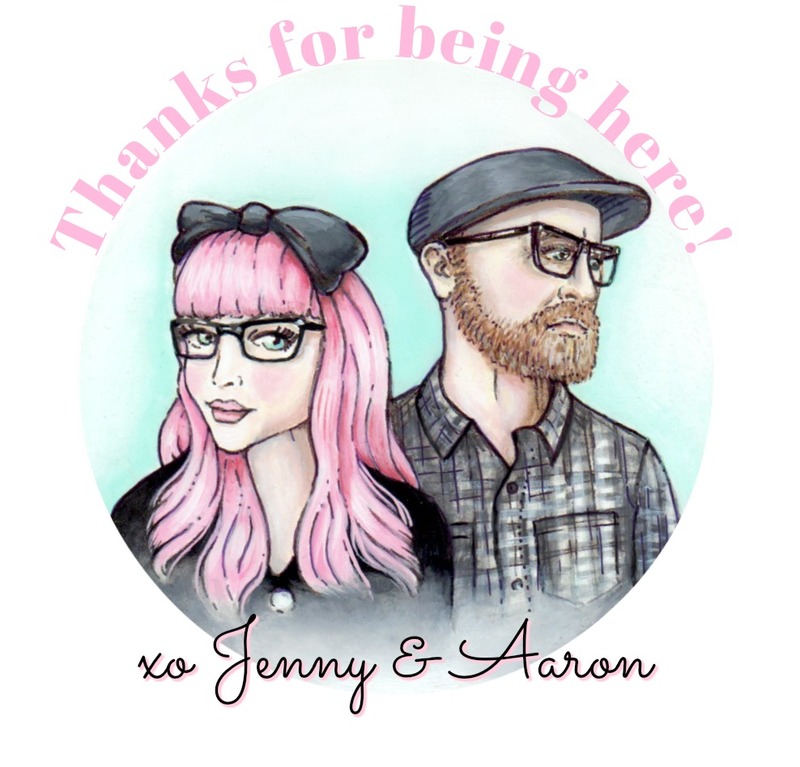 Both of these oh so talented gals will be celebrating Grand Openings of their own Etsy shops, on July 8th!! I predict a feeding frenzy!!!! 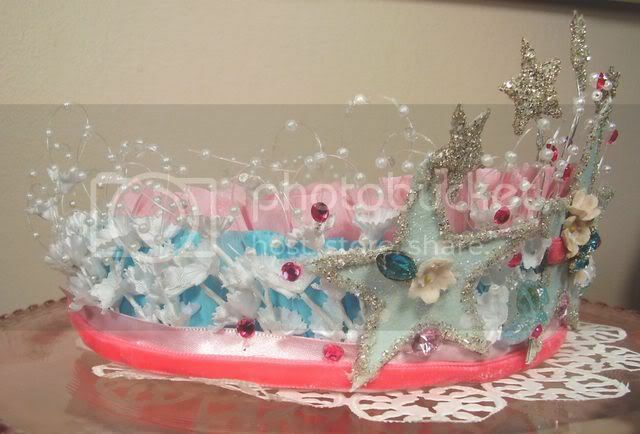 I think I've mentioned that I'm in a handmade crown and tiara swap as well. Well I got mine today and goodness gracious! What a total treasure! So many details! I think Holly might've dipped her hands in some actual magic dust before she sat down to create this...no, but really, you know how when something is so sparkly and shimmery and delicate that it just feels sorta magical? well this little crown has that feel. 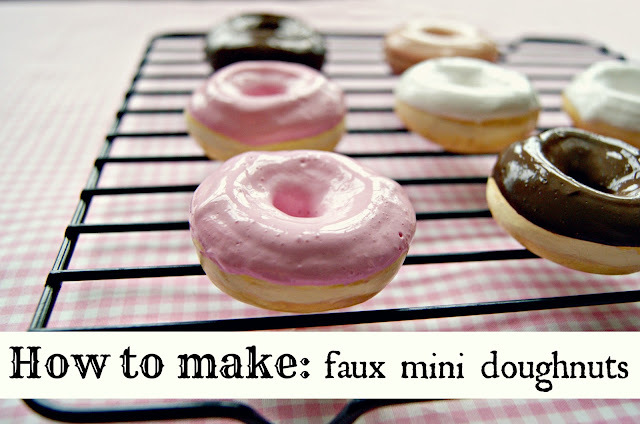 I want to find the perfect display for it...I'd love to find an aqua colored glass cake stand for it. 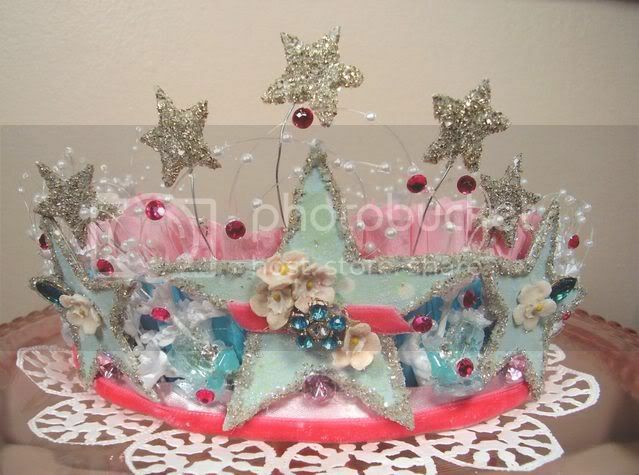 I'll be mailing Holly's crown tomorrow. I had a lot of fun making it. I hope she loves it like I love hers. Oh, you are such a lucky girl! Love those cute corsages! I'll be watching out for them on etsy! well. as usual, the mother lode of eye candy is on beautiful display here!!! little cake= very very sweet!! corsages=fabulous, i want one too!! 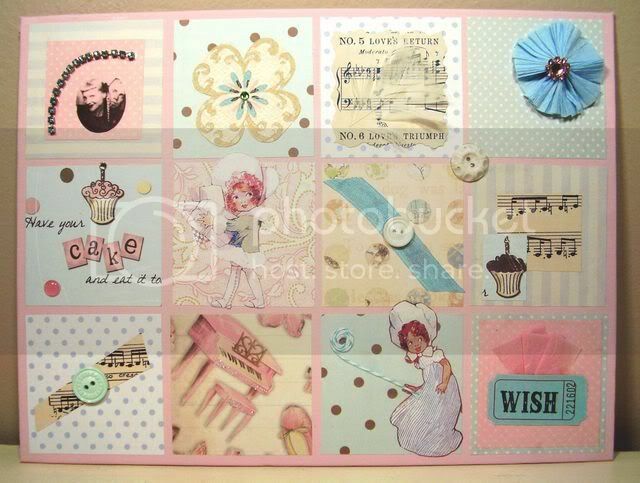 the bits~n~pieces collage is so you, love it!! Inspiration everywhere!! I love it Jenny! And that has got to be the *cutest* little boy!! What wonderful treasures arriving at your door! I love the crown! And your first collage is so fantastic!! I just discovered your blog..! you recently left some nice comments on my Flickr pictures (thank you!) 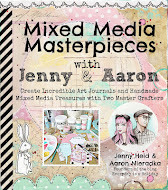 and I ended up finding you here.. Now I know what everyone has been refering to in teir blogs about "Jenny's Bits & Pieces collage swap"! Well.. I'm sorry I'm too late to join in, but I think I might take your idea and make my own anyhow! Did you host the tiara swap too? They are fabulous! I'll be keeping my eye out for your NEXT swap! Everything that Holly does is wonderful, isn't it? She is a great swap partner, I was thrilled to get something from her last week. See you at Silver Bella, I am so looking forward to it. Oh Jenny it is all so wonderful! 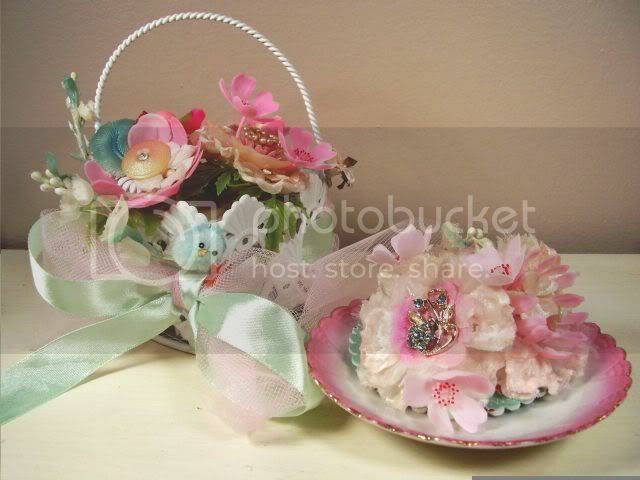 I love the cake you made and the corsages are stunning especially the way you display them! 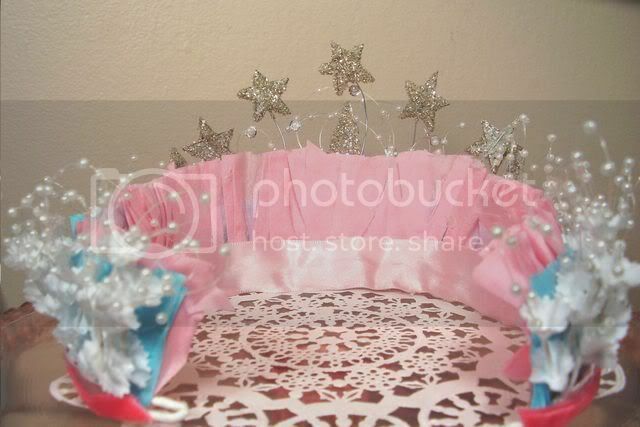 Holly's tiara, well that is divine... 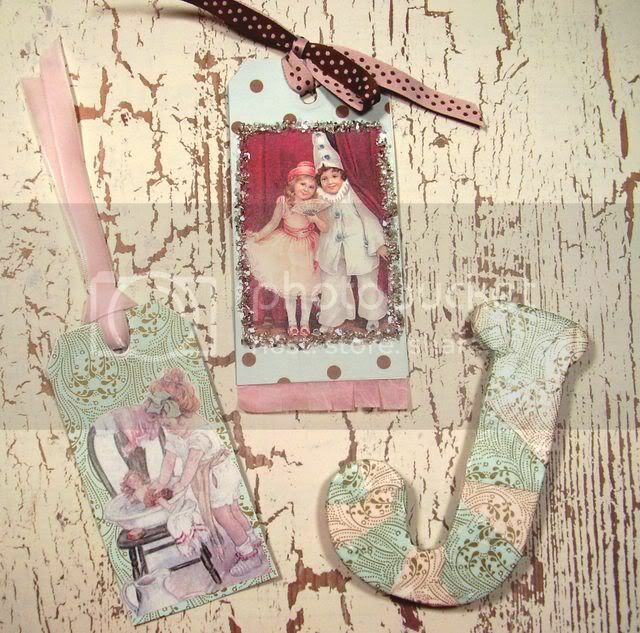 The beautiful collage & tags from Natalea, so lovely! What a lucky girl you are!!! I love the corsages! Your cake looks wonderful - maybe Adam will come around in a few years - then again - maybe it is a good thing to not like sweets! 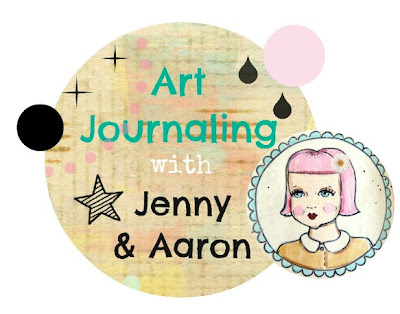 I have enjoyed seeing all the collages from bits and pieces around blogland and am sorry I didn't sign up now!! But I have taken your idea and have been kind of cleaning off my work area and using the little scraps and doodads and bits for other projects, before cutting into anything bigger. It has been fun and challenging, thanks for the inspiration to do that! Where do you find all your swaps? If you ever get tired of painting cakes and cupcakes, I think you'd make a wonderful baker!!! Your cakes are just BEAUTIFUL!!!!!!!!!!! I bet yummy too!